ECOE & ECOR pledges to conduct its operations in a manner which poses no risk to the health, well-being and safety of its employees, contractors, customers and the public at large and to make every effort to protect the environment and ensure sustainable development. We ask that managers ensure that this Policy is fully explained to and then observed by subordinates and by all contractors under their supervision. Managers' performance is judged, in part, by the HSE performance of their unit. Identifying and eliminating HSE risks in their work environment. 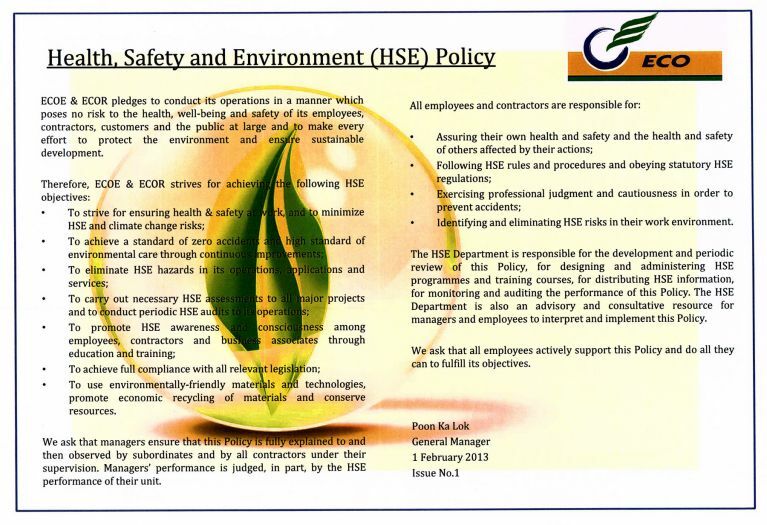 The HSE Department is responsible for the development and periodic review of this Policy, for designing and administering HSE programmes and training courses, for distributing HSE information, for monitoring and auditing the performance of this Policy. The HSE Department is also an advisory and consultative resource for managers and employees to interpret and implement this Policy. We ask that all employees actively support this Policy and do all they can to fulfill it objectives.